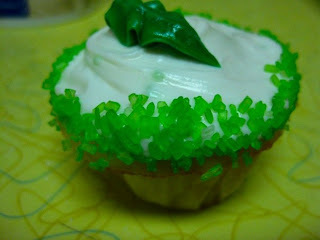 Very similar to my Lemon Drop Cupcakes, these little delights turned out a little st. patty's day. At least I won't get pinched while eating these! Follow the directions for the Cake Mix, substituting 1/3 of a cup of water for the tequila and lime juice. Add in a dash of salt for flavor, and a few green sprinkles for a mini burst of color. Bake as directed. 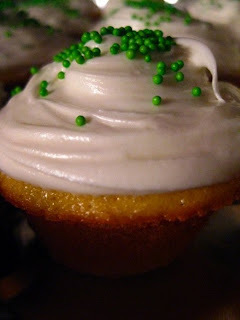 I found it's about 20 minutes for my mini-cupcakes. To make a simple buttercream, whip the butter until fluffy. Slowly add in the powdered sugar, half a cup at a time. 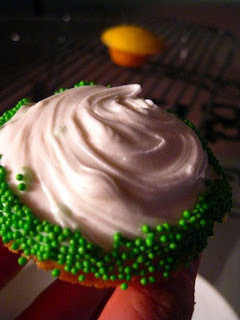 Add the tequila and lime juice and water as needed until the frosting forms stiff peaks.